Like many conservative never-Trumpers, I have decided to take a wait-and-see attitude on the president-elect -- and so far, I'd give him mixed reviews. Donald Trump has made some good Cabinet appointments. 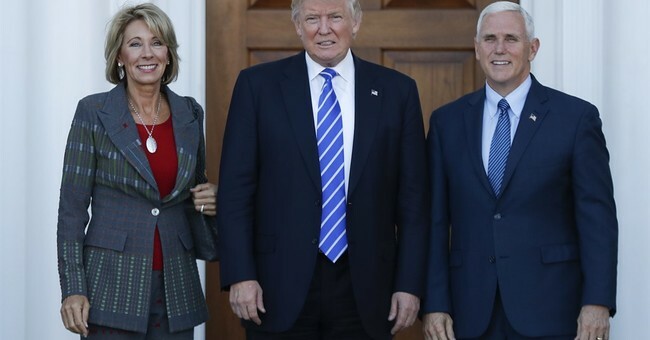 Betsy DeVos is an education reformer who will do well at the Department of Education. Rep. Tom Price as secretary of health and human services starts the job with a sound background in medicine and public policy, and he may actually have some ideas on how to provide health care to those who have trouble affording it while not destroying the world's best medical care system in the process. Similarly, Elaine Chao has credentials as an experienced agency head, having served George W. Bush for eight years as labor secretary, and as deputy secretary in the Department of Transportation, where she will now have the top job. Mike Pompeo and Jeff Sessions are both clearly prepared for their jobs -- as CIA director and attorney general, respectively -- though the latter's hard-line stance against both legal and illegal immigration is worrisome. Trump's pick for Defense, James Mattis, a retired general who led U.S. efforts in the Middle East as Central Command chief from 2010 to 2013, has drawn praise even from Democrats. But Trump's choices for Commerce and Treasury are a bit puzzling. Wilbur Ross, his nominee for secretary of commerce, is part of Trump's elite New York billionaires crowd, but he's also a Democrat and protectionist, and at 79, he hardly seems likely to be able to change his tune much. Steve Mnuchin, Trump's pick for treasury secretary, is also an odd one. Trump railed against Wall Street and hedge funds in particular, yet Mnuchin is a veteran of both, having founded his own hedge fund after leaving Goldman Sachs, where he worked for 17 years. What both men have in common is that they are Trump supporters and have lived and worked in the circles Trump is most comfortable in for years. Too bad the president-elect hasn't occupied himself solely with picking people for his Cabinet and other top posts during the past three weeks. Conservatives might have had their quibbles, and liberals would have had the usual heartburn, but he would have played out the role of his many predecessors properly. Instead, he's taken to Twitter to suggest that flag burners should have their citizenship revoked or be jailed and accused millions of undocumented immigrants of voting in the election. Of course, he did this a lot during the campaign and still won, which seems to be his rationale for continuing to do it. He's also fulfilled one of his campaign promises, to keep several hundred jobs in Indiana at a Carrier plant that was scheduled to move some of its operations to Mexico. He'll be given plaudits by his supporters for this. But the question remains, Is this what a president should be doing? Meanwhile, he apparently is skipping many of his daily national security briefings and keeps picking up the phone to talk to foreign leaders without any preparation or background to keep him from sticking his foot in his mouth. A call from Pakistani Prime Minister Muhammad Nawaz Sharif to Trump has raised eyebrows. Our relationship with Pakistan is fraught, given the role some believe that Pakistani intelligence has played in fostering terrorism, so Trump's effusive praise for Sharif and the country may prove premature. "Your country is amazing, with tremendous opportunities," Trump said, according to the Pakistani government. "Pakistanis are one of the most intelligent people. I am ready and willing to play any role that you want me to play to address and find solutions to the outstanding problems." Maybe Donald Trump will grow in the role, learning when not to say anything and, more importantly, learning how to listen to people who actually know what they are talking about. Maybe he'll finally give up his Twitter account, start reading briefing papers and learn something about complex issues he's not been interested in before. Or maybe he will just keep picking good people and let them do the job of running the government. We just don't know yet. We've never had anyone like him in the Oval Office before. The American people placed a big bet. The wheel is still turning, and no one knows where the ball will eventually land.